ARK Park is not the sort of spinoff I would have expected from ARK: Survival Evolved. The original game was a survival game, with a focus on scavenging resources and doing whatever you can to not die on an island overrun with dinosaurs. 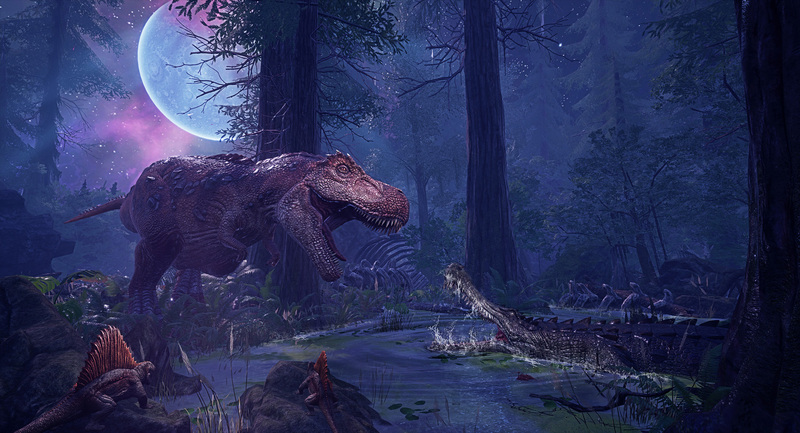 ARK Park, meanwhile, is a virtual reality dinosaur theme park, of a sort. It has some light survival elements, but it mostly exists to let you bask in the awe of seeing dinosaurs up close and personal. The game puts its best foot forward: the opening moments see you travelling by train to the main island of the titular dinosaur park, a bridge carrying you across the sea while massive dinos swim around you and the island grows ever more imposing on the horizon. It’s breathtaking. When you arrive, you get to spend as much (or as little) time as you like in a visitors lobby. Dinosaur holograms parade around, information panels give you facts about each species, and scale model in the centre of the room gives you an overview of the island, and what you can find where. It’s all very Jurassic Park-esque, which is almost certainly deliberate. More than anything else in ARK Park, the train ride and the visitor lobby sell the the idea that this place is, first and foremost, a tourist attraction. For anyone who grew up wishing that they could visit a dinosaur park in real life—Jurassic Park‘s cautionary tales be damned—ARK Park is about as close as we’re going to get, for now. When you’re ready to move on from the lobby, it’s onto the game proper. For reasons not really explained, ARK Park is the sort of wildlife park that lets people wander around relatively freely, harvest natural resources and use those to create various tools, and even hatch and raise their own dinosaurs. 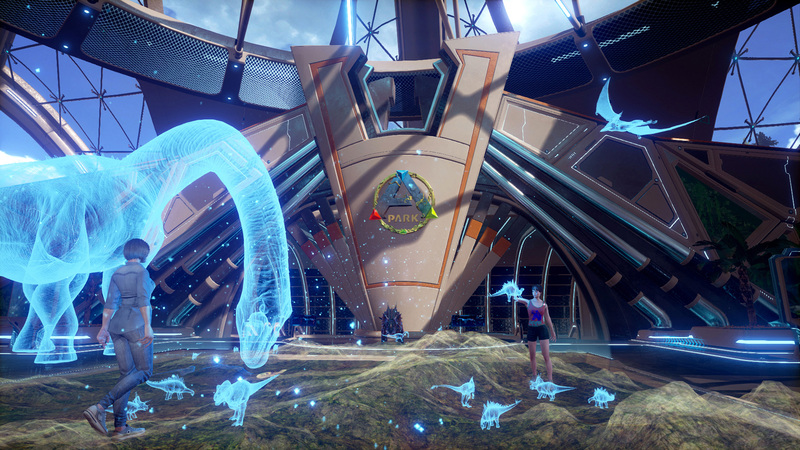 Logistical nightmares aside, that sets up one of the main game systems of ARK Park: exploration and discovery, underpinned by a simple crafting system. From the main base, you can venture out to one of a handful of different areas. Each one has its own dinosaurs to encounter, and the goal (inasmuch as there is a goal, beyond simply taking in the sights) is to collect a DNA signature from each different species in that zone. For many of them, this is a simple case of aiming your DNA scanner at their heads, but for others, you need to solve a simple puzzle to get the creature out into the open. That’s where the crafting aspect comes in: a lot of those puzzles require certain tools that you don’t have from the start. Before you can scan a giant Araneomorphus spider, for example, you need to anger it by burning its web; before you can do that, you need to craft a torch. These puzzles are a neat idea, but they’re held back by how superfluous they feel. ARK Park‘s crafting system is about as simple as such systems get: very few items are available for creation, they’re made from a handful of different resources, and said resources are all plentiful and very easy to come by. The game’s biggest strength is in letting you enjoy the wonders of a “real-life” dinosaur park, and perhaps learn a thing or two along the way, but such basic puzzles seem like a needless extra step, introduced solely to make the game more “gamey”. ARK Park is much better when it lets you just look around at your own pace and take in the sights. Even though each zone is small, there’s a lot to see and admire—not just the dinosaurs themselves, impressive though they are, but views and vistas as well. Of particular note is the Observatory zone, set in what is (presumably) the highest point on the island. It’s quite a thing to stand at the edge of a cliff hundreds of feet up, gazing out over the forests and lakes of the island, and then to turn your head and see a pterodactyl a few metres away doing the same. A few zones also include an on-rails experience, where you hop into an armoured car and travel along a set path, driving around (and under!) dinosaurs in their element. When you’re free-roaming, each creature has limited AI for what it can do, so they tend to just graze or wander around aimlessly, but the more scripted nature of the vehicle sequences allows for much more exciting encounters, like fleeing from a rampaging horde or narrowly avoiding getting stepped on by a brontosaurus. The other side of ARK Park is much less impressive: shooting. 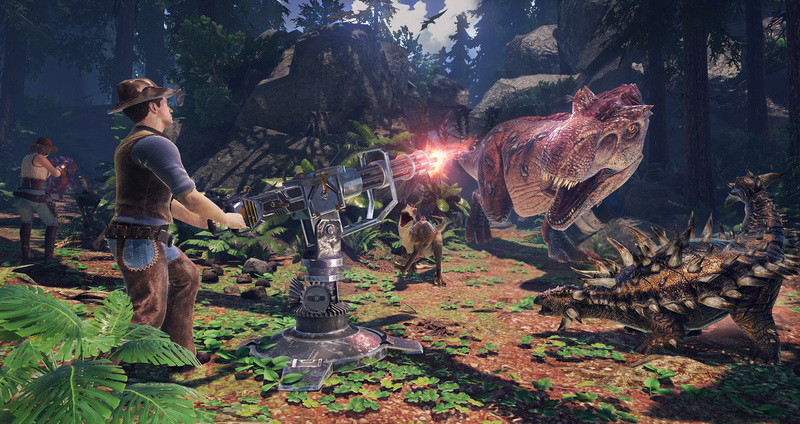 Some areas of the game have you shooting waves of angry dinosaurs, usually for flimsy reasons like trying to protect park infrastructure and technology. Like the crafting puzzles, it seems to be included purely to inject a more traditional sense of gameplay, but it feels both tacked on and completely at odds with the rest of the game’s tone. For starters, the shooting itself is very clumsy. The aiming reticule isn’t very reliable, there’s almost no feedback on whether you’ve landed a hit or not, and if you shoot too rapidly, some of those bullets seem to just fly through the target instead of actually hitting them. These levels simply have you shooting through wave after wave of dinosaurs, with nothing to really mix things up; some move faster or require more hits to take down, but not to an extent of affecting the game or your strategy in any meaningful way. But the bigger problem, for me at least, is how much of a tonal shift these levels are. The rest of ARK Park seems built largely as a celebration of natural history: you’re meant to admire and learn about these prehistoric beasts, and maybe even raise a few of your own. To suddenly turn around and start shooting them, because the electrical signal that keeps them docile (no, really) is malfunctioning is a bizarre and unpleasant turn. All the time and energy that went into making those levels could have instead gone into shoring up the things that ARK Park does best. We could have more areas to explore, a wider variety of creatures to discover, maybe even an extra car ride or two. Shooting levels make up a little more than half of the game, so that’s a significant amount of development resources spent on its weakest part. ARK Park does a good job of what it does well, and it has moments that are genuinely breathtaking. I just wish it focused all its energy on those, instead of trying to be a jack of all trades, because the end result would have been something very impressive indeed. Sadly, that’s not the case. 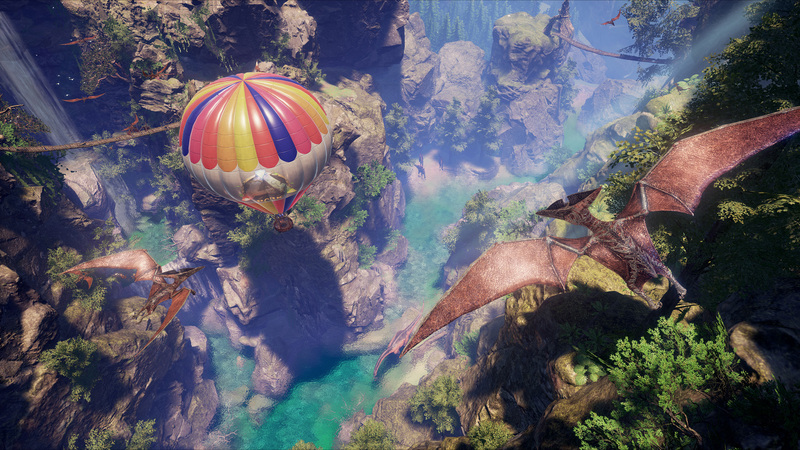 ARK Park is developed and published by Snail Games. It’s available now for PlayStation VR (reviewed), Oculus Rift, and HTC Vive.